As a student of American history, I suggest the presidential predecessor the current occupant of the White House most resembles is Andrew Johnson, an unwanted president who fought with Congress over Reconstruction and was nearly removed from office. In the mid-Civil War election of 1864, President Abraham Lincoln made the calculated political choice of Johnson as his running mate. The Tennessee Democrat was known mainly as a staunch defender of the Union despite being from the South. Johnson was elevated to the presidency on April 14, 1865, by John Wilkes Booth’s assassination of Lincoln. After only a few jubilant days of celebration following Gen. Robert E. Lee’s surrender, America was plunged into deep national mourning. In her excellent book, Andrew Johnson, Pulitzer Prize-winning historian Annette Gordon-Reed recounts the many personal characteristics uncomfortably common to Johnson and President Donald Trump. As it happens, they both loved a parade. Andrew Johnson, in one of the few shrewd political moves of his controversial and doomed tenure as chief executive, decreed that a Grand Review parade of the victorious Union armies should take place in late May 1865. 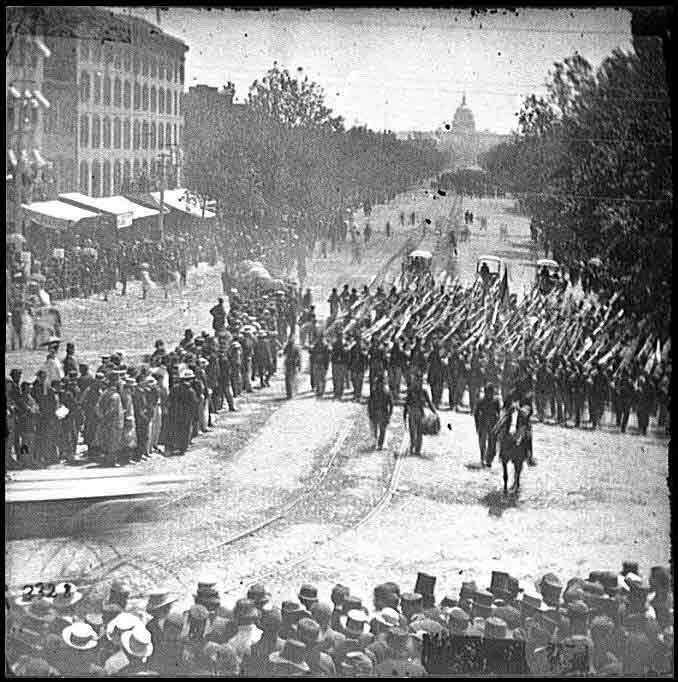 After five weeks of national mourning and Lincoln’s own funeral parade in Washington, the nation finally intended to celebrate its great Union victory. The New York Times estimated the number of people in the streets at 200,000, others estimated 50,000 more. Some 150,000 Union soldiers descended on the capital with 25,000 horses. VI Corps troops of the Army of the Potomac march past the U.S. Treasury building on Pennsylvania Avenue. Yet there is more than one definition of “parade.” A parade can be a public procession celebrating a special day or event, or it also can describe a boastful, ostentatious display of aggrandizement. I think it’s safe to say, as a former member of Congress who participated in many such events, that most Americans love a parade. Most also love America, despite our problems. A shrewd President Trump has used effective appeals to millions who want a restoration of pride in the United States. He skillfully has attacked the media and liberal “elites” who denigrate American achievements. Literally embracing the American flag, he excoriated NFL players kneeling during the national anthem. The report is that President Trump’s parade fixation was inspired last year in Paris at the annual Bastille Day parade. “It was one of the greatest parades I’ve ever seen,” Trump told reporters two months after he witnessed the celebration of Bastille Day on the Champs-Élysées in Paris on July 14. “It was military might,” he added. Perhaps the president doesn’t know that the parade he witnessed was a celebration of popular violent destruction of arbitrary governmental royal power, regarded as the beginning of the French Revolution. The Paris parade “…has always been about people, not military hardware. It’s a celebration of the French national spirit — of French national determination to uphold the values of the revolution: liberty, equality and fraternity,” writes the British historian Richard Evans. Yes, please do think about that 1865 Grand Review parade of the Union armies weeks after Lincoln’s martyrdom. But also consider Lincoln’s eloquent 1861 message to Congress. …maintaining in the world that form and substance of government whose leading object is to elevate the condition of men … to lift artificial weights from all shoulders … to clear the paths of laudable pursuit for all … to afford all an unfettered start and a fair chance, in the race of life. Hopefully, Lincoln’s words continue to describe goals which Americans can and will celebrate. Editor’s Note: Lawyer-Proof Your Life is an indispensable guide to navigating the American legal system. Spend one morning with this book, and you’ll see exactly why it’s a financial survival guide for 2018 and beyond that could save you countless hours and thousands of dollars. To order your copy today, click here now.